Bubble tea shops has been popping up from nowhere in the past few years. Bubbleology just opened its doors today, what makes this shop different to the others? The tea is freshly brewed on premises and believe me you can taste the difference in the flavour. Many bubble tea shops use powdered tea and you loose the black tea taste. 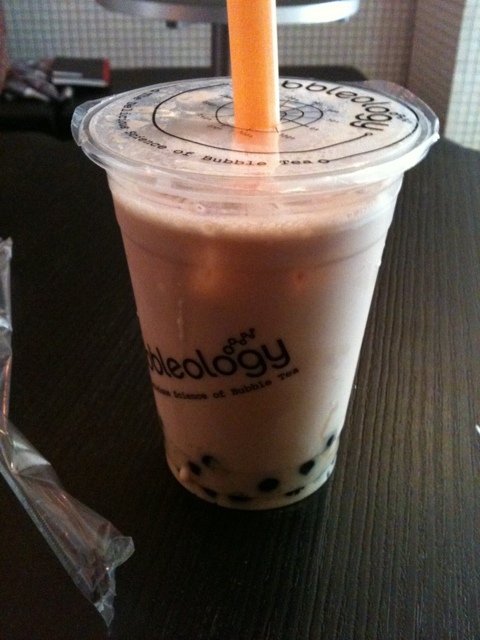 A Bubbleology brew from tea leafs. The tea is sweetened with fructose and not honey as I first thought. My next bubble tea would be the taro and fruit flavours! Great blog but I would like to introduce you also to bubble tea from Chaboba. Chaboba TM (meaning bubble tea) opened beginning of February 2011 and we specialise in bubble tea from Taiwan. Our teas (we use tea leafs) and bobas are made freshed each day on site. Our ingredients and equipments have been carefully selected from Taiwan to bring all our customers an authentic bubble tea experience. We are based in Camden Lock, London. Please feel free to pop down and try one of our bubble teas and have fun watching our bubble tea baristas make you a perfect bubble tea. I would like to invite you to visit us for a sample. Hope to see you very soon. I think I may have popped in once but never got to purchase the bubble tea.